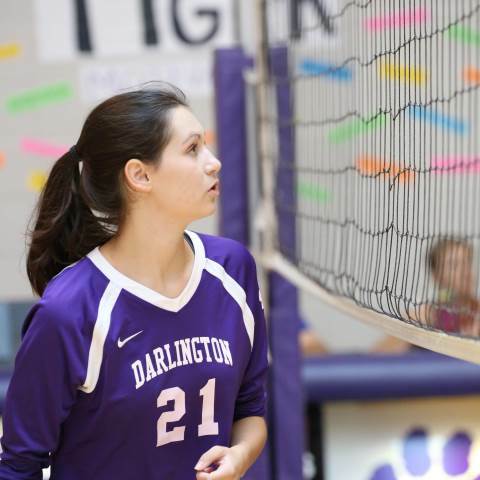 Abby Sklar (‘18), a 12-year day student at Darlington, and her mother, Lauren Sklar, reflect on the Darlington experience and their support of The Darlington Fund in the Q&A below. Originally from Rome, Abby is now a freshman political science major at Boston University and she refers to her time at Darlington as invaluable. 1. How did you end up as a student at Darlington? I came to Darlington in first grade, which was a decision my parents made after touring the school when I was in kindergarten. I was a very shy kid, and my parents saw how Darlington could help me flourish. 2. What were some of your involvements as a student? Throughout middle school and high school, I played volleyball, which I really enjoyed. I played with all of my friends and made new ones through the team first. Some of my best and funniest memories come from my time playing volleyball. However, I was most involved with the school newspaper, The Darlingtonian. I got involved, sort of by accident, my sophomore year, and it became what defined my high school experience. By my senior year, I was editor-in-chief and the journalism classroom was where I spent so much of my time. 3. How would you describe your Darlington experience? My time at Darlington is so invaluable to me, and I’m just beginning to understand all the ways that Darlington shaped me and helped me grow. Darlington introduced me to the world. It helped me define my personal values. It provided a community that empowered me to explore my passions and figure out how I wanted those passions to guide my future. And I know that my network of Darlington connections will continue to grow throughout the rest of my life. 4. What impact did your time as a Darlington student have on your life? I went to Darlington for 12 years, so the school is integral to who I am. Almost all of my memories have a Darlington connection, whether they actually happened at school or just involve the friends I made there. 6. Why is it important for alumni to engage with the school? What impact can alumni have on Darlington's future? Part of what makes Darlington so special is the buy in from the community. It was always so nice to hear alumni talk about their time on campus and to see how special Darlington was to them, even all these years later. 7. What inspires you to contribute to The Darlington Fund? I have no idea who I would be without Darlington, and that is why I feel it’s so important to show my appreciation by giving to The Darlington Fund. When you make a contribution, you are expressing your support of this very special place and your commitment to Darlington students for generations to come. 8. How would you explain The Darlington Fund to someone who didn't understand it? The Darlington Fund makes so many parts of the Darlington experience possible because it helps to provide for those activities and programs that really make the school special. 9. How does The Darlington Fund impact the student experience at Darlington? I would say that the majority of students don’t know what The Darlington Fund is or how it shapes their experience, but that’s partly because of how integral to Darlington it is. It’s so easy to never question how certain programs are funded or how they are made possible. The Darlington Fund is vital in making Darlington what it is. 10. How did your involvement as an Advancement Ambassador shape your experience and perspective? One of the coolest parts of being an Advancement Ambassador was getting to call alumni to raise money for The Darlington Fund. I especially loved to call those who had graduated upward of 30 years ago because many hadn’t visited campus in a while, and they were so excited to hear about my experience and share their own. It was always interesting to hear how their experiences differed from mine and also how important Darlington still is to them even after so long. 1. How did your children end up as students at Darlington? Abby came in first grade and Emma came in kindergarten. My brother and sister both went to Darlington, so I've always known about it. 2. How were you involved as a parent? During both of my children's lower school years, I was always class parent. I was president of Tiger Pride during their lower school years. I served again as president of Tiger Pride for two years when Abby was in upper school. I've always been in involved parent in any way needed. Our Darlington experience has been positive for both our girls. The small class size and sense of community starting in lower school continues throughout. The dedicated teachers who know our girls as people as well as students means they teach the whole child. The accessibility to teachers allows them to advocate for themselves. 4. How has Darlington impacted your family’s life? Both of our girls have been positively shaped by Darlington. Darlington is a student-centered environment that allows students to think for themselves, advocate for themselves and be involved in a community that offers a variety of ways to be individuals. 5. What has been your favorite part of this experience? There have been so many! Our lower school days are especially memorable as the girls participated in class plays, class projects, donuts for dads, muffins for mom and sweet grandparent days. Middle school brought more individual projects where we saw our girls think for themselves, use more of their own gifts, and of course the overnight and weeklong field trips were educational and fun memory makers at the same time. High school showed our girls navigating harder classes which instilled confidence and participating in activities that they chose and felt gifted in. 6. Why is it important for parents and alumni to engage with the school? What impact can they have on Darlington’s future? Darlington has a long legacy of producing confident contributors to the school and society itself. Parents need to engage in the school to have a front row seat to their child's education. Darlington isn't just a school, it's a community that builds strong people, not just strong students. Having been in leadership positions in parent organizations I have seen first-hand how The Darlington Fund can expand our children's educational opportunities. A lot of the “extras” our students receive are because of generous donations that are given. Darlington is able to offer more experiences for the individual learner inside and outside of the classroom due to The Darlington Fund. 8. As a parent of alum and current parent, what would you like to say to those who have been loyal supporters? Thank you for the investment in not only the students at Darlington, but the school itself. It is in all of our best interest for Darlington to be sustainable and strong for the next 100 plus years as it makes our children's diplomas that much more meaningful and strong in the marketplace of colleges, jobs, and careers. Click here to make a gift to The Darlington Fund online. You may also mail a check to the Advancement Office at 1014 Cave Spring Road Rome, GA 30161 or call 706-236-0417 with your credit card information. Stock transfer instructions are available upon request.